Almost everyone schoolboy these days has heard of the Lorentz transformations which replace the Galileian transformations in Special Relativity. They are basically a means of dealing with the relative motion of two bodies with respect to two orthogonal co-ordinate systems. Lorentz first developed them in an ad hoc manner somewhat out of desperation in order to ‘explain’ the null result of the Michelson-Morley experiment and other puzzling experimental results. Einstein, in his 1905 paper, developed them from first principles and always maintained that he did not at the time even know of Lorentz’s work. What were Einstein’s assumptions? 2. The speed of light in free space has the same value for all observers in inertial frames irrespective of the relative motion of the source and the observer. As has since been pointed out, Einstein did, in fact, assume rather more than this. For one thing, he assumed that ‘free space’ is homogeneous and isotropic (the same in all directions) (Note 1). A further assumption that Einstein seems to have made is that ‘space’ and ‘time’ are continuous ─ certainly all physicists at the time assumed this without question and the wave theory of ele tro-magnetism required it as Maxwell was aware. However, the continuity postulate does not seem to have played much of a part in the derivation of the equations of Special Relativity though it did stop Einstein’s successors from thinking in rather different ways about ‘Space/Time’. Despite everything that has happened and the success of Quantum Mechanics and the photo-electric effect and all the rest of it, practically all students of physics think of ‘space’, ‘time’ and electro-magnetism as being ‘continuous’, rather than made up of discrete bits especially since Calculus is primarily concerned with ‘continuous functions’. Since nothing in the physical world is continuous, Calculus is in the main a false model of reality. Inertial frames, which play such a big role in Special Relativity, as it is currently taught, do not exist in Nature : they are entirely man-made. It was essentially this realisation that motivated Einstein’s decision to try to formulate physics in a way that did not depend on any particular co-ordinate system whatsoever. Einstein assumed relativity and the constancy of the speed of light and independently deduced the Lorentz transformations. This post would be far too long if I went into the details of Special Relativity (I have done this elsewhere) but, for the sake of the general reader, a brief summary can and should be given. Those who are familiar with Special Relativity can skip this section. Also, if we are locating an event rather than an object, we will need a fourth specification, a ‘time’ co-ordinate telling us when such and such an event happened. For example, if a balloon floating around the room at a particular time, to pinpoint the event, it would not be sufficient to give its three spatial co-ordinates, we would need to give the precise time as well. Despite all the hoo-ha, there is nothing in the least strange or paradoxical about us living in a ‘four-dimensional universe’. Of course, we do done : the only slight problem is that the so-called fourth dimension, time, is rather different from the other three. For one thing, it seems to only have one possible direction instead of two; also the three ‘spatial’ directions are much more intimately connected to each other than they are to the ‘time’ dimension. A single unit serves for the first three, say the metre, but for the fourth we need a completely different unit, the second, and we cannot ‘see’ or ‘touch’ a second whereas we can see and touch a metre rod or ruler. Now, suppose we have a second ‘box’ moving within the original box and moving in a single direction at a constant speed. We select the x axis for the direction of motion. Now, an event inside the smaller box, say a pistol shot, also takes place within the larger box : one could imagine a man firing from inside the carriage of a train while it has not yet left the station. If we take the corner of the railway carriage to be the origin, clearly the distance from where the shot was fired to the railway carriage origin will be different from the distance from where the buffers train are. In other words, relative to the railway carriage origin, the distance is less than the distance to the buffers. How much less? Well, that depends on the speed of the train as it pulls out. The difference will be the distance the train has covered since it pulled out. If the train pulls out at constant speed 20 metres/second metres/second and there has been a lapse of, say, 4 seconds, the distance will be 80 metres. More generally, the difference will be vt where t starts at 0 and is counted in seconds. So, supposing relative to the buffers, the distance is x, relative to the railway carriage the distance is v – xt a rather lesser distance. All well and good and nobody before the dawn of the 20th century gave much more thought to the matter. Newton was somewhat puzzled as to whether there was such a thing as ‘absolute distance’ and ‘absolute time’, hence ‘absolute motion’, and though he believed in all three, he accepted that, in practice, we always had to deal with relative quantities, including speed. If we consider sound in a fluid medium such as air or water, the ‘speed’ at which the disturbance propagates differs markedly depending on whether you are yourself stationary with respect to the medium or in motion, in a motor-boat for example. Even if you are blind, or close your eyes, you can tell whether a police car is moving towards or away from you by the pitch of the siren, the well-known Doppler effect. The speed of sound is not absolute but depends on the relative motion of the source and the observer. There is something a little unsettling in the idea that an object does not have a single ‘speed’ full stop, but rather a variety of speeds depending on where you are and how you are yourself moving. However, this is not too troublesome. What about light? In the latter 19th century it was viewed as a disturbance rather like sound that was propagated in an invisible medium, and so it also should have a variable speed depending on one’s own state of motion with respect to this background, the ether. However, no differences could be detected. Various methods were suggested, essentially to make the figures come right, but Einstein cut the Gordian knot once and for all and introduced as an axiom (basic assumption) that the speed of light in a vacuum (‘free empty space’) was fixed and completely independent of the observer’s state of motion. In other words, c, the speed of light, was the same in all co-ordinate systems (provided they were moving at a relative constant speed to each other). This sounded crazy and brought about a completely different set of ‘transformations’, known as the Lorentz Transformations although Einstein derived them independently from his own first principles. This derivation is given by Einstein himself in the Appendix to his ‘popular’ book “Relativity : The Special and General Theory”, a book which I heartily recommend. Whereas physicists today look down on books which are intelligible to the general reader, Einstein himself who was not a brilliant student at university (he got the lowest physics pass of his year) and was, unlike Newton, not a particularly gifted pure mathematician, took the writing of accessible ‘popular’ books extremely seriously. Einstein is the author of the staggering put-down, “If you cannot state an issue clearly and simply, you probably don’t understand it”. If we use the Galileian Tranformations and set v = c , the speed of light (or any form of electro-magnetism) in a vacuum, we have x = ct or with x in metres and t in seconds, x = 3 × 108 metres (approximately) when t = 1 second. Transferring to the other co-ordinate system which is moving at v metres/sec relative to the first, we have x’ = x – vt and, since t’ is the same as t, when dividing we obtain for x’ /t’ , (x – vt)/t = ((x/t) – v) = (c – v), a somewhat smaller speed than c. This is exactly what we would expect if dealing with a phenomenon such as sound in a fluid medium. However, Einstein’s postulate is that, when dealing with light, the ratio distance/time is constant in all inertial frames, i.e. in all real or imaginary ‘boxes’ moving in a single direction with a constant difference in their speeds. The reader unused to mathematics will find them forbidding and they are indeed rather tiresome to handle though one gets used to them. If you take the ratio If x’ /t’ you will find ─ unless you make a slip ─ that, using the Lorentz Transformations you eventually obtain c as desired. The amazing thing that this is true for any value of v ─ provided it is less than c ─ so it applies to any sort of system moving relative to the original ‘box’, as long as the relative motion is constant and in a straight line. It is true for v = 0 , i.e. the two boxes are not moving relatively to each other : in such a case the complicated Lorentz Transformations reduce to x’ = x t’ = t and so on. The Lorentz/Einstein Transformations have several interesting and revealing properties. Though complicated, they do not contain terms in x2 or t2 or higher powers : they are, in mathematical parlance, ‘linear’. This is what we want for systems moving at a steady pace relatively to each other : squares and higher powers rapidly produce erratic increases and a curved trajectory on a space/time graph. Secondly, if v is very small compared to c, the ratio v/c which appears throughout the formulae is negligible since c is so enormous. For normal speeds we do not need to bother about these terms and the Galileian formulae give satisfactory results. Finally, and this is possibly the most important feature : the Lorentz/Einstein Transformations are ‘symmetric’. That is, if you work backwards, starting with the ‘primed’ frame and x’ and t’, and convert to the original frame, you end up with a mirror image of the formulae with a single difference, a change of sign in the x’ to x formula denoting motion in the opposite direction (since this time it is the original frame that is moving away). Poincaré was the first to notice this and could have beaten Einstein to the finishing line by enunciating the Principle of Relativity several years earlier ─ but for some reason he didn’t, or couldn’t, make the conceptual leap that Einstein made. The point is that each way of looking at the motion is equally valid, or so Einstein believed, whether we envisage the countryside as moving towards us when we are in the train, or the train moving relative to the static countryside. Relativity from Ultimate Event Theory? Einstein assumed relativity and the constancy of the speed and deduced the Lorentz Transformations : I shall proceed somewhat in the opposite direction and attempt to derive certain well-known features of Special Relativity from basic assumptions of Ultimate Event Theory (UET). What assumptions? Between any two events in an event-chain there are a fixed number of ultimate events. And (to recap basic definitions) an ultimate event is an event that cannot be further decomposed — this is why it is called ultimate. Thus, if the ultimate events in a chain, or subsection of a chain, are numbered 0, 1, 2, 3…….n there are n intervals. And if the event-chain is ‘regular’, sort of equivalent of an intertial system, the ‘distance’ between any two successive events stays the same. By convention, we can treat the ‘time’ dimension as vertical — though, of course, this is no more than a useful convention. The ‘vertical’ distance between the first and last ultimate events of a regular event-chain thus has the value n × ‘vertical’ spacing, or n × t. Note that whereas the number n¸ indicating the quantity of ultimate events and intervals, is fixed in a particular case, t turns out to be a parameter which, however, has a minimum ‘rest’ value noted t0. This minimal ‘rest’ value is (by hypothesis) the same for all regular event-chains. …. Likewise, between any two ‘contemporary’ i.e. non-successive, ultimate events there are a fixed number of spots where ultimate events could have (had) occurrence. If there are two or more neighbouring contemporary ultimate events bonded together we speak of an event-conglomerate and, if this conglomerate repeats or gives rise to another conglomerate of the same size, we have a ‘conglomerate event-chain’. (But normally we will just speak of an event-chain). A conglomerate is termed ‘tight’, and the region it occupies within a single ksana (the minimal temporal interval) is ‘full’ if one could not fit in any more ultimate events (because there are no available spots). And, if all the contemporary ultimate events are aligned, i.e. have a single ‘direction’, and are labelled 0, 1, 2, 3…….n , then, there are likewise n ‘lateral’ intervals along a single line. If the event-conglomerate is ‘regular’, the distance between any two neighbouring events will be the same and, for n events has the value n × ‘lateral’ inter-event spacing, or n × s. Although s, the spacing between contemporary ultimate events must obviously always be greater than the spot occupied by an ultimate event, for all normal circumstances it does not have a minimum. It has, however, a maximum value s0 . Each ultimate event is thus enclosed in a four-dimensional ‘space-time capsule’ much, much larger than itself — but not so large that it can accommodate another ultimate event. This ‘space-time capsule’ has the mixed dimension s3t. In practice, when dealing with ‘straight-line’ motion, it is only necessary to consider a single spatial dimension which can be set as the x axis. The other two dimensions remain unaffected by the motion and retain the ‘rest’ value, s­0. Thus we only need to be concerned with the ‘space-time’ rectangle st. The extent, or size, of the ‘space-time capsule’ within which an ultimate event can have occurrence (and within which only one can have occurrence) is absolute. This size is completely unaffected by the nature of the ultimate events and their interactions with each other. We are talking about the dimensions of the ‘container’ of an ultimate event. The actual region occupied by an ultimate event, while being non-zero, is extremely small compared to the dimensions of the container and may for most purposes be considered negligible, much as we generally do not count the mass of an electron when calculating an atom’s mass. Just as an atom is mainly empty space, a space time capsule is mainly empty ‘space-time’, if the expression is allowed. Note that the postulate does not state that the ‘shape’ of the container remains constant, or that the two ‘spatial’ and ‘temporal’ dimensions should individually remain constant. It is the extent of the space-time parallelipod’ s3t which remains the same or, in the case of the rectangle it is the product st ,that is fixed, not s and t individually. 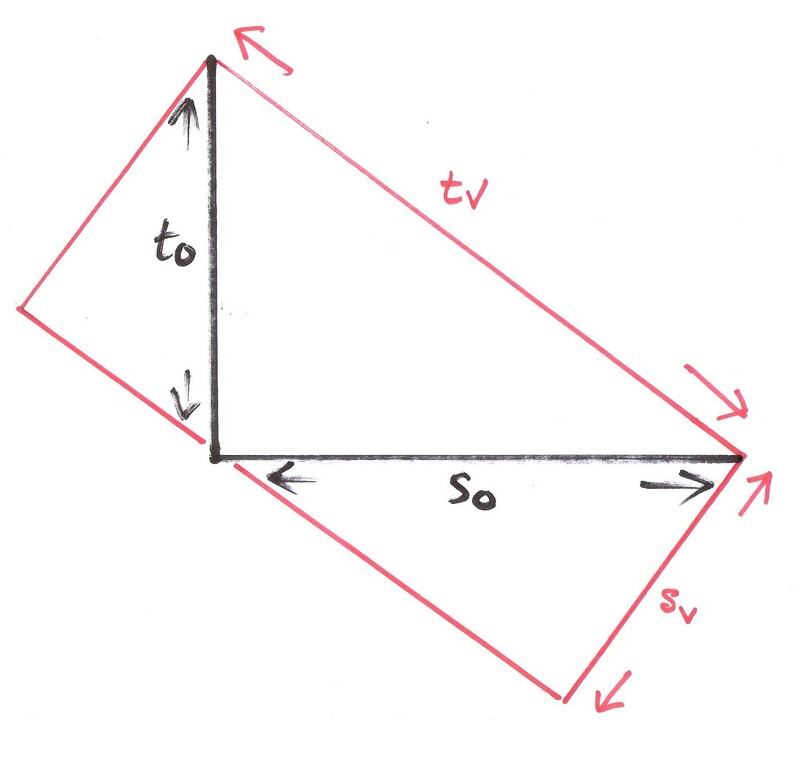 All quantities have minimum and maximum values, so let the minimum temporal interval be named t0 and, conversely, let s0 be the maximum value of s. Thus the quantity s0 t0 , the ‘area’ of the space-time rectangle, is fixed once and for all even though the temporal and spatial lengths can, and do, vary enormously. We have, in effect a hyperbola where xy = constant but with the difference that the hyperbola is traced out by a series of dots (is not continuous) and does not extend indefinitely in any direction (Note 3). This quantity s0 t0 is an extremely important constant, perhaps the most important of all. I would guess that different values of s0 t0 would lead to very different universes. The quantity is mixed so it is tacitly assumed that there is a common unit. What this common unit is, is not clear : it can only be based on the dimensions of an ultimate event itself, or its precise emplacement (not its container capsule), since K0 , the backdrop or Event Locality does not have a metric, is elastic, indeterminate in extent. Although one can, in imagination, associate or combine all sorts of events with each other, only events that are bonded sequentially constitute an event-chain, and only bonded contemporary events remain contemporary in successive ksanas. This ‘bonding’ is not a mathematical fiction but a very real force, indeed the most basic and most important force in the physical universe without which the latter would collapse at any and every moment — or rather at every ksana. Now, within a single ksana one and only one ultimate event can have occurrence. However, the ‘length’ of a ksana varies from one event-chain to another since, although the size of the emplacements where the ultimate events occur is (by hypothesis) fixed, the spacing is not fixed, is indeterminate though the same in similar conditions (Note 5). The length of a ksana has a minimum and this minimal length is attained only when an event-chain is at rest, i.e. when it is considered without reference to any other event-chain. This is the equivalent of a ‘proper interval’ in Relativity. So t is a parameter with minimal value t0. It is not clear what the maximum value is though there must be one. Thus, the ‘space-time’ paralleliped s3t has the value (s0)3t0 , an absolute value. Every event-chain is at rest with respect to the Event Locality K0 and may be considered to be ‘stationary’. Why this postulate and what does it mean? We all have experience of objects immersed in a fluid medium and there can also be events, such as sounds, located in this medium. Now, from experience, it is possible to distinguish between an object ‘at rest’ in a fluid medium such as the ocean and ‘in motion’ relative to this medium. And similarly there will be a clear difference between a series of siren calls or other sounds emitted from a ship in a calm sea, and the same sequence of sounds when the ship is in motion. Essentially, I envisage ultimate events as, in some sense, immersed in an invisible omnipresent ‘medium’, K­0, — indeed I envisage ultimate events as being localized disturbances of K0. (But if you don’t like this analogy, you can simply conceive of ultimate events having occurrence on an ‘Event Locality’ whose purpose is simply to allow ultimate events to have occurrence and to keep them separate from one another.) The Rest Postulate simply means that, on the analogy with objects in a fluid medium, there is no friction or drag associated with chains of ultimate events and the medium in or on which they have occurrence. This is basically what Einstein meant when he said that “the ether does not have a physical existence but it does have a geometric existence”. What’s the point of this constant if no one knows what it is? Firstly, it by no means follows that this constant s0 t0 is unknowable since we can work backwards from experiments using more usual units such as metres and seconds, giving at least an approximate value. I am convinced that the value of s0 t0 will be determined experimentally within the next twenty years, though probably not in my lifetime unfortunately. But even if it cannot be accurately determined, it can still function as a reference point. Galileo was not able to determine the speed of light even approximately with the apparatus at his disposal (though he tried) but this did not stop him stating that this speed was finite and using the limit in his theories without knowing what it was. “What,” asked Zeno of Elea “is the speed of a particular chariot in a chariot race?” Clearly, this depends on what your reference body is. We usually take the stadium as the reference body but the charioteer himself perceives the spectators as moving towards or away from him and he is much more concerned about his speed relative to that of his nearest competitor than to his speed relative to arena. We have grown used to the idea that ‘speed’ is relative, counter-intuitive though it appears at first. But ‘distance’ is a man-made convenience as well : it is not an ‘absolute’ feature of reality. People were extremely put out by the idea that lengths and time intervals could be ‘relative’ when the concept was first proposed but scientists have ‘relatively’ got used to the idea. But everything seems to be slipping away — is there anything at all that is absolute, anything at all that is real? Ultimate Event Theory evolved from my attempts to ponder this question. The answer is, as far as I am concerned, yes. To start with, there are such things as events and there is a Locality where events occur. Most people would go along with that. But it is also one of the postulates of UET that every macroscopic ‘event’ is composed of a specific number of ultimate events which cannot be further decomposed. Also, it is postulated that certain ultimate events are strongly bonded together into event-chains temporally and event-conglomerates laterally. There is a bonding force, causality. Also, associated with every event chain is its Event Number, the number of ultimate events between the first event A and the last Z. This number is not relative but absolute. Unlike speed, it does not change as the event-chain is perceived in relation to different bodies or frames of reference. Every ultimate event is precisely localised and there are only a certain number of ultimate events that can be interposed between two events both ‘laterally’ (spatially) and ‘vertically’ (temporally). Finally, the size of the ‘space-time capsule’ is fixed once and for all. And there is also a maximum ‘space/time displacement ratio’ for all event-chains. This is quite a lot of absolutes. But the distance between ultimate events is a variable since, although the dimensions of each ultimate event are fixed, the spacing is not fixed though it will remain the same within a so-called ‘regular’ event-chain. It is important to realize that the ‘time’ dimension, the temporal interval measured in ksanas, is not connected up to any of the three spatial dimensions whereas each of the three spatial dimensions is connected directly to the other two. It is customary to take the time dimension as vertical and there is a temptation to think of t, time, being ‘in the same direction’ as the z axis in a normal co-ordinate system. But this is not so : the time dimension is not in any spatial direction but is conceived as being orthogonal (at right angles) to the whole lot. To be closer to reality, instead of having a printed diagram on the page, i.e. in two dimensions, we should have a three dimensional optical set-up which flashes on and off at rhythmic intervals and the trajectory of a ‘particle’ (repeating event-chain) would be presented as a repeating pinpoint of light in a different colour. 2s/t0 ; 3s/t0 ; 4s/t0 ;…… n s/t0 and so on right up to c s/t0 . But to what do we relate the spacing s ? To the ‘vertical’ event-chain or to slanting one? We must relate s to the event-chain under consideration so that its value depends on v so v = v sv The ratio s/t0 is thus a mixed ratio sv/t0 . tv gives the intervals between successive events in the ‘moving’ event-chains and the number of these intervals does not increase because there are only a fixed number of events in any event-chain evaluated in any way. These temporal intervals thus undoubtedly increase because the hypotenuse gets larger. What about the spacing along the horizontal ? Does it also increase? Stay the same? If we now introduce the Constant Size Postulate which says that the product sv tv = s0 t0 we find that sv decreases with increasing v since tv certainly increases. There is thus an inverse ratio and one consequence of this is that the mixed ratio sv/t0 = s0/tv and we get symmetry. This leads to relativity whereas any other relation does not and we would have to specify which regular event-chain ‘really’ is the vertical one. One can legitimately ask which is the ‘real’ spatial distance between neighbouring events? The answer is that every distance is real and not just real for a particular observer. Most phenomena are not observed at all but they still occur and the distances between these events are real : we as it were take our pick, or more usually one distance is imposed on us. Now the real pay off is that each of these regular event-chains with different speeds v is an equally valid description of the same event-chain. Each of these varying descriptions is true even though the time intervals and distances vary. This is possible because the important thing, what really matters, does not change : in any event-chain the number and order of the individual events is fixed once and for all although the distances and times are not. Rosser, in his excellent book Introductory Relativity, when discussing such issues gives the useful analogy of a gamer of tennis being played on a cruise liner in calm weather. The game would proceed much as on land, and if in a covered court, exactly as on land. And yet the ‘speed’ of the ball varies depending on whether you are a traveller on the boat or someone watching with a telescope from another boat or from land. The ‘real’ speed doesn’t actually matter, or, as I prefer to put it, is indeterminate though fixed within a particular inertial frame (event system). Taking this one step further, not just the relative speed but the spacing between the events of a regular event-chain ‘doesn’t matter’ because the constituent events are the same and appear in the same order. It is interesting that. on this interpretation, a certain indeterminacy with regard to distance is already making its appearance before Quantum Theory has even been mentioned. Which distance or time interval to choose? Since, apparently, the situation between regular event-chains is symmetric (or between inertial systems if you like) one might legitimately wonder how there ever could be any observed discrepancy since any set of measurements a hypothetical observer can make within his own frame (repeating event system) will be entirely consistent and unambiguous. In Ultimate Event Theory, the situation is, in a sense, worse since I am saying that, whether or not there is or can be an observer present, the time-distance set-up is ‘indeterminate’ — though the number and order of events in the chain is not. Any old ‘speed’ will do provided it is less than the limiting value c. So this would seem to make the issue quite academic and there would be no need to learn about Relativity. The answer is that this would indeed be the case if we as observers and measurers or simply inhabitants of an event-environment could move from one ‘frame’ to another effortlessly and make our observations how and where we choose. But we can’t : we are stuck in our repeating event-environment constituted by the Earth and are at rest within it, at least when making our observations. We are stuck with the distance and time units of the laboratory/Earth event-chain and cannot make observations using the units of the electron event-chain (except in imagination). Our set of observations is fully a part of our system and the units are imposed on us. And this does make a difference, a discernible, observable difference when dealing with certain fast-moving objects. Take the µ-meson. µ-mesons are produced by cosmic rays in the upper reaches of the atmosphere and are normally extremely short-lived, about 2.2 × 10–6 sec. This is the (average) ‘proper’ time, i.e. when the µ-meson is at rest — in my terms it would be N × t0 ksanas. Now, these mesons would, using this t value, hardly go more than 660 metres even if they were falling with the speed of light (Note 4). But a substantial portion actually reach sea level which seems impossible. Now, we have two systems, the meson event-chain which flashes on and off N times whatever N is before terminating, i.e. not reappearing. Its own ‘units’ are t0 and s0 since it is certainly at rest with itself. For the meson, the Earth and the lower atmosphere is rushing up with something approaching the limiting speed towards it. We are inside the Earth system and use Earth units : we cannot make observations within the meson. The time intervals of the meson’s existence are, from our rest perspective, distended : there are exactly the same number of ksanas for us as for the meson but, from our point of view, the meson is in motion and each ‘motion’ ksana is longer, in this case much much longer. It thus ‘lives’ longer, if by living longer we mean having a longer time span in a vague absolute way, rather than having more ‘moments of existence’. The meson’s ksana is worth, say, eight of our ksanas. But the first and last ultimate event of the meson’s existence are events in both ‘frames’, in ours as well as its. And if we suppose that each time it flashed into existence there was a (slightly delayed) flash in our event-chain, the flashes would be much more spaced out and so would be the effects. So we would ‘observe’, say, a duration of, say, eight of ‘our’ ksanas between consecutive flashings instead of one. And the spatial distance between flashes would also be evaluated in our system of metres and kilometres : this is imposed on us since we cannot measure what is going on within the meson event-chain. The meson actually would travel a good deal further in our system — not ‘would appear to travel farther’. Calculations show that it is well within the meson’s capacity to reach sea level (see full discussion in Rosser, Introductory Relativity pp. 71-3). What about if we envisaged things from the perspective of the meson? Supposing, just supposing, we could transfer to the meson event-chain or its immediate environment and could remember what things were like in the world outside, the familiar Earth event-frame. We would notice nothing strange about ‘time’, the intervals between ultimate events, or the brain’s merging of them, would not surprise us at all. We would consider ourselves to be at rest. What about if we looked out of the window at the Earth’s atmosphere speeding by? Not only would we recognize that there was relative motion but, supposing there were clear enough landmarks (skymarks rather), the distances between these marks would appear to be far closer than expected — in effect there would be a double or triple sense of motion since our perception of motion is itself based on estimates of distance. As the books say, the Earth and its atmosphere would be ‘Lorentz contracted’. There would be exactly the same number of ultimate events in the meson’s trajectory, temporarily our trajectory also. The first and last event of the meson’s lifetime would be separated by the same number of temporal intervals and if these first and last events left marks on the outside system, these marks would also be separated by exactly the same number of spatial intervals. Only these spatial intervals — distances — would be smaller. This would very definitely be observed : it is as if we were looking out at the countryside on a familiar journey in a train fantastically speeded up. We would still consider ourselves at rest but what we saw out of the window would be ludicrously foreshortened and for this reason we would conclude that we were travelling a good deal faster than on our habitual journey. I do not think there would be any obvious way to recognize the time dilation of the outside system. One is often tempted to think that the time dilation and the spatial contraction cancel each other out so all this talk of relativity is purely academic since any discrepancies should cancel out. This would indeed be the case if we were able to make our observations inside the event-chain we are observing, but we make the measurements (or perceptions) in a single frame. Although it is the meson event-chain that is dictating what is happening, both the time and spatial distance observations are made in our system. It is indeed only because of this that there is so much talk about ‘observers’ in Special Relativity. The point is not that some intelligent being observes something because usually he or she doesn’t : the point is that the fact of observation, i.e. the interaction with another system seriously confuses the issue. The ‘rest-motion’ situation is symmetrical but the ‘observing’ situation is not symmetrical, nor can it be in such circumstances. This raises an important point. In Ultimate Event Theory, as in Relativity, the situation is ‘kinematically’ symmetrical. But is it causally symmetrical? Although Einstein stressed that c was a limit to the “transfer of causality” he was more concerned with light and electro-magnetism than causality. UET is concerned above all with causality — I have not mentioned the speed of light yet and don’t need to. In situations of this type, it is essential to clearly identify the primary causal chain. This is obviously the meson : we observe it, or rather we pick up indications of its flashings into and out of existence. The observations we make, or simply perceptions, are dependent on the meson, they do not by themselves constitute a causal chain. So it looks at first sight as if we have a fundamental asymmetry : the meson event-chain is the controlling one and the Earth/observer event chain is essentially passive. This is how things first appeared to me. But on reflection I am not so sure. In many (all?) cases of ‘observation’ there is interaction with the system being observed and it is inevitably going to be affected by this even if it has no senses or observing apparatus of its own. One could thus argue that there is causal symmetry after all, at least in some cases. There is thus a kind of ‘uncertainty principle’ due to the interaction of two systems latent in Relativity before even Quantum Mechanics had been formulated. This issue and the related one of the limiting speed of transmission of causality will be dealt with in the subsequent post. Note 1. And in point of fact, if General Relativity is to be believed, ‘free space’ is not strictly homogeneous even when empty of matter and neither is the speed of light strictly constant since light rays deviate from a straight path in the neighbourhood of massive bodies. Note 2 For those people like me who wish to believe in the reality of K­0 — rather than seeing it as a mere mathematical convenience like a co-ordinate system — the lack of any ‘friction’ between the medium or backdrop and the events or foreground would, I think. be quite unobjectionable, even ‘obvious’, likewise the entire lack of any ‘normal’ metrical properties such as distance. The ‘backdrop’, that which lies ‘behind’ material reality though in some sense permeating it, is not physical and hence is not obliged to possess familiar properties such as a shape, a metric, a fixed distance between two points and so on. Nevertheless, this backdrop is not completely devoid of properties : it does have the capacity to receive (or produce) ultimate events and to keep them separate which involves a rudimentary type of ‘geometry’ (or topology). Later, as we shall see, it would seem that it is affected by the material points on it, so that this ‘geometry’, or ‘topology’, is changed, and so, in turn, affects the subsequent patterning of events. And so it goes on in a vicious or creative circler, or rather spiral. The relation between K0, the underlying substratum or omnipresent medium, and the network of ultimate events we call the physical universe, K1 is somewhat analogous to the distinction between nirvana and samsara in Hinayana Buddhism. Nirvana is completely still and is totally non-metrical, indeed non-everything (except non-real), whereas samsara is turbulence and is the world of measure and distancing. It is alma de-peruda, the ‘domain of separation’, as the Zohar puts it. The physical world is ruled by causality, or karma, whereas nirvana is precisely the extinction of karma, the end of causality and the end of measurement. Note 3 The ‘Space-time hyperbola’ , as stated, does not extend indefinitely either along the ‘space’ axis s (equivalent of x) or indefinitely upwards along the ‘time’ axis (equivalent of y). — at any rate for the purposes of then present discussion. The variable t has a minimum t0 and the variable s a maximum s0 which one suspects is very much greater than tc . Since there is an upper limit to the speed of propagation of a causal influence, c , there will in practice be no values of t greater than tc and no s values smaller than sc . 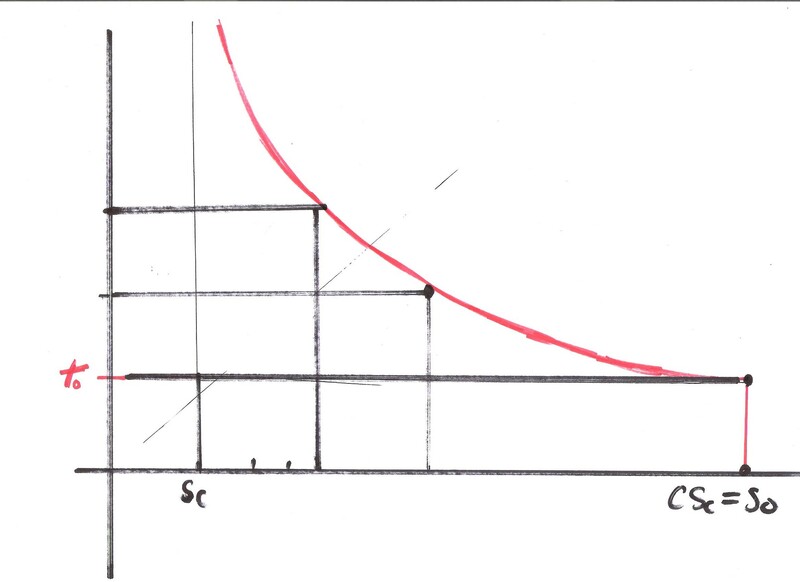 It thus seems appropriate to start marking off the s axis at the smallest value sc = s0/ c which can function as the basic unit of distance. Then s0 is equal to c of these ‘units’. We thus have a hyperbola something like this — except that the curve should consist of a string of separate dots which, for convenience I have run together. Note 4 See Rosser, Introductory Relativity pp. 70-73. Incidentally, I cannot recommend too highly this book. Note 5 I have not completely decided whether it is the ‘containers’ of ultimate events that are elastic, indeterminate, or the ‘space’ between the containers (which have the ultimate events inside them)’. I am inclined to think that there really are temporal gaps not just between ultimate events themselves but even between their containers, whereas this is probably not so in the case of spatial proximity. This may be one of the reasons, perhaps even the principal reason, why ‘time’ is felt to be a very different ‘dimension’. Intuitively, or rather experientially, we ‘feel’ time to be different from space and all the talk about the ‘Space/Time continuum’ — a very misleading phrase — is not enough to dispel this feeling.